Taylor's & Company is proud to offer this selection of fine leather products and accessories from Kirkpatrick Leather to compliment our guns. We chose only the best designs and the finest materials and manufacturing processes to make your decision an easy one. If you don't see a Kirkpatrick product here that you like, gives us a call and we'll order it for you. Plain, With Metal Reinforced Skirt. Tan, Black, or Brown, Plain, Basket-Weave, or Hand-Tooled. Tan, black or brown. Basket weave or plain. Available in Dark Brown, Reddish Brown, and Tan. Fits Carbines,Rifles, and Shotguns. 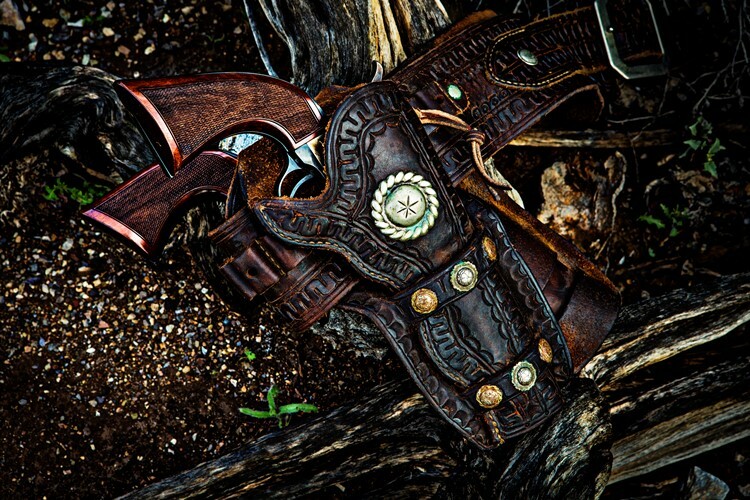 A replica of the rig used by John Wayne in many of his movies, this holster is handmade from quality, hand-dyed Herman Oak Leather, and molded for smooth draw and easy re-holstering. Edges are burnished and painted and includes a latigo hammer tie-down. Available in dark brown color. This leather ammo shell holder laces onto the 1886 rifle stock and the loops are sized for .45-70 ammo. Available in black or brown and holds 6 shells. Made in the USA. Made of buffalo leather, this wrap offers a cushion for fingers by filling the excess space inside the lever. The included leather lace provides an authentic look. This leather shot shell holder laces onto a shotgun stock and the loops are sized for 12 Gauge shells. Available in dark brown and holds 4 shells. Made in the USA. This 1911 mag pouch holds two standard magazines on your belt for easy loading. Available in black or brown leather. Made in the USA. These leather bags are hand made out of tanned leather. They are great for throwing ammo or other things in for the range. The color will vary slightly on the bags. Made in the USA. Available in Large (5"x9"), Medium (5"x6"), and Small (4"x4") sizes and sizes will vary.